Taking the smartphone experience a notch higher, today Motorola introduced its most advanced smartphone ever in India – the limited-edition moto z² force. “The moto z² force shatters limitations with the only screen guaranteed not to crack or shatter** and comes bundled with Moto TurboPower™ Pack for up to a combined two days of power (6220 mAh)*1. 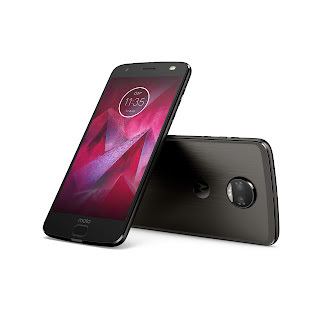 The device sets high innovation standards with a slim all-metal design, two 12MP cameras, the fastest possible data speed and Qualcomm’s fastest Snapdragon processor, and instantly transforms with moto mods, allowing users to engage in their passions and connect with the world in meaningful, intentional and purposeful ways. Most smartphone owners have experienced the pain of breaking their screen. With Moto ShatterShield™ technology, you don’t have to worry anymore, with a 13.97 cm (5.5) Quad HD AMOLED display that’s guaranteed not to crack or shatter*. 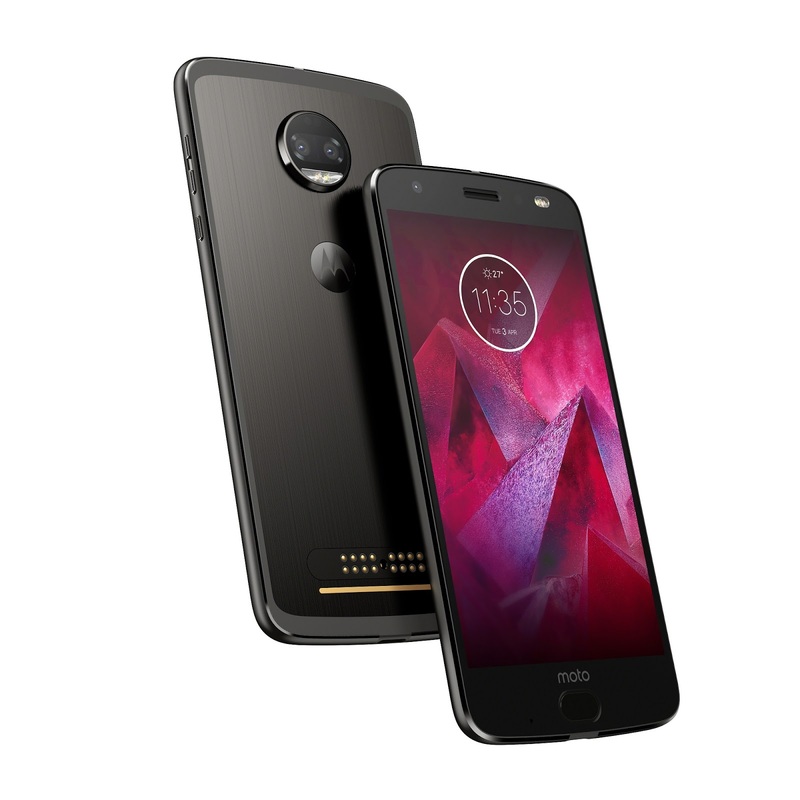 The slim, polished design of the new moto z² force is reinforced with the strength of 7000 series aluminum allowing it to withstand the wear and tear of everyday life. It’s a combination you simply can’t find anywhere else. Forget all your battery woes with the Moto TurboPower Pack which adds an extra day of battery life when maximizing power is a priority. Users can recharge their phone fast (up to 15W) on the go when they need to power up. And if your power pack runs out of juice, plug it into a 30W TurboPower charger and get up to 50% of capacity in just 20 minutes. With 6GB RAM and the powerful Qualcomm® Snapdragon™ 835 Mobile Processor, the phone features unbeatable performance, instant responsiveness, and the fastest possible data speeds with Gigabit LTE.Users can download large files or stream music and videos – even in Ultra HD; this means no more waiting for pages to load, so you can surf the web effortlessly. Now you can focus on what’s most important and take professional looking photos with dual 12MP cameras, one monochrome and one color. These cameras work together to capture brilliant, top quality photos. You can even shoot like a pro by adding a blur effect to the background or foreground of images, thanks to the two cameras that enable true depth of field. The moto z2 force features Motorola’s exclusive Moto Experiences, including night display that automatically adjusts your screen to warmer tones at night and instant queries in Moto Voice that provide helpful information like the daily weather or calendar updates. Also, the front fingerprint reader with one button nav lets you quickly navigate your phone. 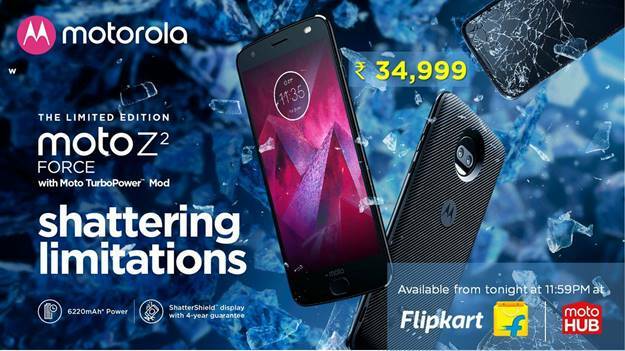 The limited edition moto z2 force with Moto Turbopower Pack will be available exclusively at a price of INR 34,999/- on Flipkart and Moto Hubs across India. *T&C Apply. Available only on Flipkart. Visit Moto Z2 force page on Flipkart for details. *1Combined battery of the fully charged Moto Z2 Force with in-built 2,730mAh battery & a fully charged Moto TurboPower™ Pack with 3,490mAh battery. Based on milliamp hours with Efficiency Mode activated. Actual battery performance will vary and depends on many factors including signal strength, network configuration, age of battery, operating temperature, features selected, device settings, and voice, data, and other application usage patterns. **The display and embedded lens are under warranty against shattering and cracking for four (4) years from the original date of purchase. This phone is not shockproof or designed to withstand all damage from being dropped. All other warranty exclusions, including scratches and other cosmetic damage, intentional damage or abuse, normal wear and tear, and other limitations apply; visit motorola.com for details and warranty coverage.